This article focuses on some key areas of our economy. These areas are export promotion, attracting FDI, entrepreneurship and innovation, augmenting the labour force with more women, and education. An underlying theme throughout the article is the need to enhance Total Factor Productivity and its sub-component, labour productivity. Throughout the article the writer poses probing questions, the answers to which will help us to discover what our stand should be in relation to some of the most pressing issues of our economy. Export-led growth – how serious are we? Almost a decade after the end of the internal armed conflict in Sri Lanka, the country’s economy is confronted with a large and growing debt, while the growth outlook is moderate. A rising US dollar, amidst tighter global financial conditions, has increased credit risks for countries with large external funding needs as pointed out by Moody’s Investors Service. “Countries with large current account deficits, high external debt repayments and substantial foreign-currency Government debt are most exposed to the impact of a stronger US dollar” and Sri Lanka fits into this category. Therefore, Sri Lanka has to increasingly concentrate on reducing her debt burden and tapping non-debt creating financial inflows such as foreign direct investments, while enhancing foreign exchange earnings through exports (both merchandise and service exports) and tourism. Sri Lanka has experimented with many development strategies. In the seventies we tried import substitution under a closed economy. In 1977 we opened the economy with a “bang!” i.e. in haste, thereby creating problems like putting some domestic industries out of business overnight. We have sung the chorus of “export promotion” or an “export-led economic growth path” for a very long time now, but not paid serious attention to it, instead mostly focusing on infrastructure development projects (some of them eye-catching, yet grandiose). While saying that we want to promote exports, we sometimes try to do it by devaluing the rupee or by handing out subsidised credit to selected export categories, with attendant harmful consequences. Have we thought about what international markets demand from us and tried to figure out what we can produce competitively to cater to such demand? Or are we trying to produce whatever we can and hope against hope that the international market would buy whatever we produce? Do we disseminate proper market information so that our entrepreneurs will be encouraged to produce what the market is demanding? Or do we simply provide subsidised credit to selected entrepreneurs and hope that by some magic they will turn out to be successful exporters? Going by the numerous subsidised credit schemes that we have offered to “would be exporters” over the years, by now we should have created a very large number of new exporters with the capacity to produce competitive goods for export. How far have we succeeded by adopting this subsidised credit route? Or should we provide subsidised credit (where appropriate) to budding exporters (for a limited period of time) while ensuring that they channel such funds to producing goods demanded by international markets, utilising proper market information disseminated to them through an effective mechanism ? Have we identified our competitive strengths? Have we identified our niche markets? If we have identified these things, then how far have we progressed in executing our plan of action in promoting exports on these lines? The International Monetary Fund (IMF), in one of its recent reports on Sri Lanka’s economy, has observed that protectionism has been a key factor that has weakened the country’s trade competitiveness. The IMF report has further noted that lobbying rather than strategic development or high employment have been the main reasons for protecting certain sectors. Sri Lanka’s trade and FDI regimes are more restrictive than the average emerging market in all key areas according to trade policy indicators recently developed by the IMF. Introduction of para-tariffs in the country during the last decade has effectively doubled the protection rates, making the present import regime of Sri Lanka one of the most complex and protectionist in the world, inhibiting Sri Lanka’s entry into Global Production Networks. When domestic industries are protected in this manner, resources that can be otherwise allocated to export industries, tend to be allocated to protected domestic industries, thereby resulting in a misallocation of resources. This is what we refer to as the anti-export bias. Para-Tariffs are defined as charges on imports that act as a tariff but are not included in a country’s tariff schedule. Para-Tariffs in Sri Lanka include the Ports and Airports Development Levy (PAL), the Commodity Export Subsidy Scheme (CESS), and the Special Commodity Levy (SCL). In relation to Sri Lanka, the World Bank has identified the Ports and Airports Development Levy (PAL) and the Cess as two para-tariffs with high potential for reform. The objective of increasing para-tariffs in Sri Lanka was not only to protect domestic industries, but also to support the declining revenue base. It is good to note that the Government has announced that it will adopt a time-bound plan to eliminate para-tariffs and conduct a comprehensive review of tariffs. (IMF Country Report No.18/176 - Sri Lanka – selected issues – June, 2018; Vision 2025 document of GOSL). As described above, protectionism has led to the anti-export bias in Sri Lanka’s trade policy. This has weakened Sri Lanka’s export performance. 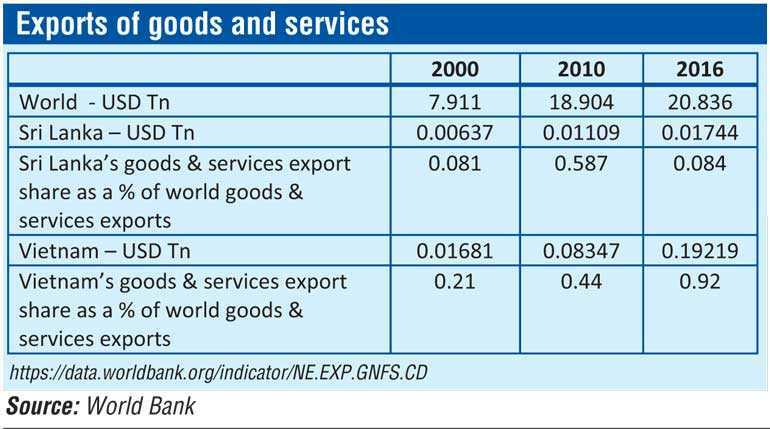 Sri Lanka’s share of global merchandise exports had reduced from 0.08% in 2000 to 0.06% in 2016, while its merchandise exports as a share of its GDP had declined from 33.3% in 2000 to 12.9% in 2017(Vision 2025, GOSL). From the above, it is clear that if Sri Lanka is serious about export promotion it has to significantly reduce protection rates (mainly through dismantling para-tariffs) as early as possible. The next section deals with an area that is very much related to export promotion. Despite its complex and expensive system of tax incentives, including tax holidays, to promote investment, Sri Lanka’s foreign investment has remained below 2% of GDP (compared to 6.3% of GDP in Vietnam in 2017) over the past twenty years. Further, new FDI in the past few years has been predominantly infrastructure oriented, with only a relatively small proportion reaching sectors that are associated with global value chains. The record FDIs in 2017 worth $ 1.9 b was largely due to projects by Chinese State-owned companies and by a very few firms. Political stability and consistent policies are two key areas that foreign investors look at when deciding to invest in a country. An equally important aspect would be ease of doing business. Sri Lanka was ranked 111th out of 190 economies in the Ease of Doing Business Index 2018 which shows that there are opportunities for improvement. This year, improvements are expected in the areas of starting a business, property registration and construction permits. Reforms are also required to address critical challenges in areas like land ownership. At present, land is mainly state-owned in Sri Lanka, and land administration is weak and cumbersome. Many FDI projects had been discouraged due to land issues as indicated by anecdotal evidence (Nenova 2018). It is encouraging to note that the BOI (the main FDI facilitation body) is being actively reoriented towards modern investment promotion at a time when the Government is also liberalising the foreign exchange controls (Nenova 2018). Policy uncertainty in Sri Lanka has been a key dampener of foreign investor sentiments, along with a lack of information on regulations, high fragmentation in policymaking, frequent policy changes and slow policy implementation (Nenova 2018). Further, street protests in Sri Lanka are very common. This is something that will simply put off foreign investors. Therefore, the Government will have to take a tough stand on street protests and completely ban them if we are serious about attracting FDI. Consistent Government policies combined with effective and efficient delivery of Government services is required for entrepreneurs to thrive. What entrepreneurs require is ease of doing business so that they can set about their tasks speedily, and speed is everything in a competitive business environment. Encouraging more innovation and entrepreneurship is also important. Investment in research and development (R&D) for 2017 in Sri Lanka was only 0.16% of GDP (dominated by public spending), which is lower than in some of the other Asian countries, such as India (0.69%), Indonesia (0.9%), Bangladesh (0.56%),Thailand (0.35%), Vietnam (0.32%) and Malaysia (1.27 %). It is important to improve public and private funding, address fragmentation of R&D institutions, improve the intellectual property rights regime and create an ecosystem with early-stage finance and incubation facilities (Sri Lanka Development Update – June, 2018, The World Bank; www.rdmag.com). Innovation and R&D will have to play an increasingly important role in the context of Sri Lanka having to increase its Total Factor Productivity (TFP) at a much earlier stage in our development trajectory. This is due to the rapidly ageing population of Sri Lanka, and the country having to deal with ageing at a much earlier point in our development process. Therefore, the country can no longer drive growth simply through labour augmentation. That is why Sri Lanka will have to diligently work on increasing her Total Factor Productivity to drive growth. Hence, innovation and R&D will have to play a crucial role in driving Total Factor Productivity (Dr. Indrajith Coomaraswamy – Saman Kelegama Memorial lecture, 2018). The next section deals with another important area of our economy and that is our education system. Needless to say, good education will directly contribute to enhance labour productivity which is a sub-component of Total Factor Productivity. Our education – how relevant is it? Our A/L students depend on tuition rather than on schools for their education. Then why have A/L classes in our schools? Or can we do something to improve the quality of teaching in our A/L classes at schools so that more students could be encouraged to attend those classes? Sri Lankan students from grade-1 to grade-12 are trained to focus on exams. Their main objective is to pass exams. We don’t have a system of problem based learning. Our education is not oriented towards solving problems. As pointed out by Dr. Bandula Wijeratne at a recent lecture delivered by him, our learning should be very much application oriented to meet industry and workplace requirements. Testing of students should be done throughout the year and not be limited to questions given during the last month of the semester. According to Mano Sekaram (Chief Executive and Co-founder of 99X Technology), “Sri Lankan universities have a body of knowledge, but no R&D capacity to solve problems and generate new ideas”. Sekaram points out that there has to be a sizeable talent pool with the relevant skills to attract investors into research or tech. He warns that if not, even local businesses may move out to where there is talent. “By opening our borders to R&D experts Sri Lanka can attract more investments into research institutes, education and healthcare as technology permeates these areas. This will raise Sri Lanka’s game to a whole new level” (Sekaram 2018). Do we encourage innovation in our schools and universities? If I may borrow a few more ideas from Dr. Wijeratne, our students should be able to appreciate innovation, entrepreneurship and risk taking rather than seeking stable jobs in the Government sector. In developed country universities (and in more progressive local universities) examinations are commonly held on ‘open book’ basis. Under such open book examinations, “teachers can devise questions that require students to answer in more critical and analytical ways thus encouraging high-order thinking; as compared to closed book or traditional exams that tend to encourage rote learning and more superficial application of knowledge” (A guide to academics – University of Newcastle, Australia). Getting on to another dimension, does our education system encourage us to celebrate the successes of each other, rather than trying to bring down those who are doing well? Does our education system impart to us the skill to rejoice at the other person’s success, thereby leading to a happier life for everyone? (Deepal Sooriyaarachchi: Inward Bound for Mindful Living). Do we as a nation suffer from jealousy? Are we incapable of rejoicing at the success of others? Can our education system be radically changed so that it will encourage the celebration of the successes of each other? Team work and praising each other for good work should be an integral part of our education system, and these skills should be imparted to students from their tender years. What the private sector requires is men and women with integrity, who can think, and solve problems, and harmoniously interact with their fellow staff members. Is the Sri Lankan education system geared towards meeting that requirement? Female population in Sri Lanka edges the male population with 51.6% of the total population being females (for mid-2017). The total female population was 11,062,000 and the male population was 10,382,000 as at mid-2017. Thus, the female population exceeds the male population by 680,000 (Department of Census and Statistics). However, when considering the economically active population, women account for a mere 36.6% of the economically active population(the economically active population or the labour force is comprised of all persons who are 15 years and above, who are either “employed” or “unemployed” during the reference period). Sri Lanka’s overall unemployment rate for 2017 was 4.2%. While male unemployment was 2.9%, female unemployment recorded a much higher figure of 6.5%. These numbers show the potential to augment Sri Lanka’s workforce by taking steps to increase the participation of women in the labour force. Augmenting the labour force with more women will eventually help improve the economic growth of the country (Department of Census and Statistics). Therefore, even though the country can no longer drive growth simply through labour augmentation, due to a rapidly ageing population (as explained in the section on “entrepreneurship and innovation”), there is still a window of opportunity to augment the labour force by inducting more women into it. The main reason for women to stay at home rather than being employed is the need to look after their kids. Therefore, if the Government could take steps to encourage provision of safe childcare and day care for children, it will undoubtedly help to attract more women into the labour force. The next section deals with an area related to labour productivity, which is a sub-component of Total Factor Productivity. Is our island paradise a three-wheeler paradise? How serious are we about public transport… or are we going to just clog our existing roads and the roads that we are going to build in the future, with cars, three-wheelers and other contraptions, and eternally complain about traffic blocks. This is why we need to radically think about improving our public transport. Good quality public transport will reduce traffic, help to reduce our energy bill, save people time, enhance labour productivity and increase the gross happiness of people, since they will be able to spend more time with their families than on the roads. Too many elections and short election cycles mess up long-term strategising due to governments becoming preoccupied with winning elections at any cost by engaging in activities such as offering salary hikes, jobs in the state sector for graduates passing out from state universities, and dolling out cash subsidies and subsidised credit in the name of ‘development’. The costs of these activities will anyway be recouped from the public by way of new taxes/levies and increases in existing taxes/levies. So, overall, there will be no net gain for the masses, or they will be left worse off than before because they will have to stomach higher rates of inflation, fuelled by excessive Government expenditure, in addition to being burdened by higher taxes, imposed to recoup that expenditure. Of course, higher rates of inflation triggered by these activities, and resultant macroeconomic instability, will unravel many good objectives such as promoting exports. Are we a reactive or a proactive nation? Do we as a nation opt to do something and try to sort out the resultant mess later? Or do we first think out properly, strategise, and come out with a proper plan, and try to figure out how things may go wrong when implementing such a plan, and be ready with remedial and backup action to mitigate such adverse consequences that may crop up when implementing that plan? The Japanese, we are told, debate a proposed decision thoroughly, throughout the organisation, whether in business or in government institutions. Through such a process they reach consensus. It is only after reaching consensus that they make the decision. Can we Sri Lankans learn from the Japanese? Vision 2025 document of the Government of Sri Lanka (GOSL). IMF Country Report No.18/176 – Sri Lanka – selected issues – June, 2018. 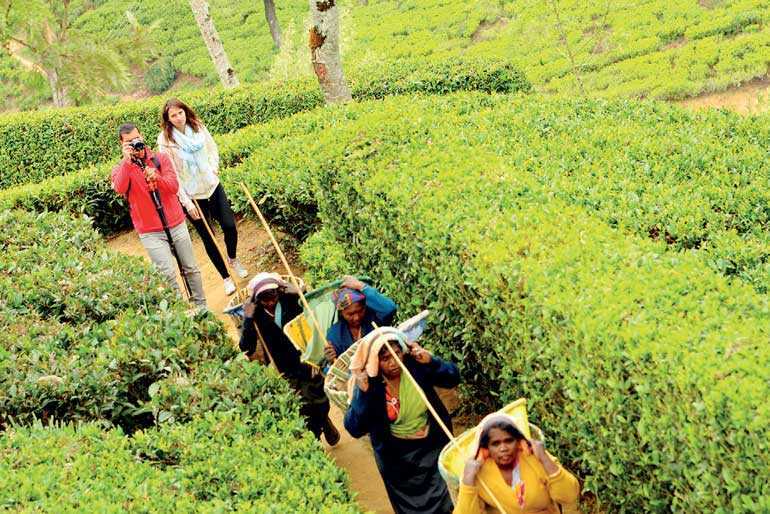 Sri Lanka Development Update – June, 2018, The World Bank. R&D Magazine - www.rdmag.com – 59th annual edition of forecast of global research and development and related trends. Tatiana Nenova (World Bank): Five reasons why Sri Lanka needs to attract FDIs – 30 May 2018 – Daily FT. Tatiana Nenova is a Program Leader for Sri Lanka and Maldives at the World Bank, responsible for Financial Markets, Trade and Competitiveness, Macro and Fiscal, Governance, and Poverty.